Consider 'The Problem' well and truly solved. 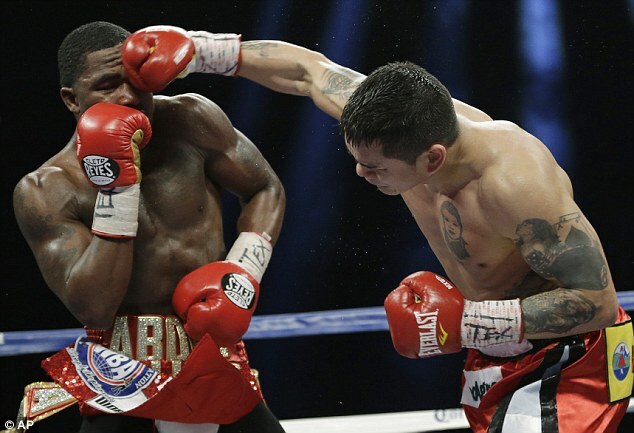 Adrien Broner, the brash, trash-talking, self-appointed heir to Floyd Mayweather Jnr's throne, was beaten by Marcos Maidana in Texas on Saturday night. Instead it was Maidana, who lost to Amir Khan in 2010, who delivered on his promise to inflict a first defeat on the 24-year-old, knocking him down twice en-route to a unanimous points win. In doing so, he replaces Broner as the WBA world welterweight champion and throws his hat into the ever-expanding ring to face Mayweather himself. But the pound-for-pound No 1 was among the first to offer his commiserations to the loser. 'Hold your head up champ. I love you. A true champion can take a loss and bounce back, my little brother,' he tweeted. But while Broner - nicknamed 'The Problem' - must take stock after a rapid rise through the weights, Maidana can finally shed his nearly-man tag. Three high-profile losses to Khan, Andreas Kotelnik and Devon Alexander suggested a man who was good, but not quite good enough. His previous world title, the WBA light-welterweight crown, was won outside the ring after he was upgraded from interim champion. But there was nothing convenient about this success. The hard-hitting Argentine, who had stopped 31 of his previous 34 victims, staggered Broner early in the opening round with an overhand right to the back of the head, causing the American to stumble trying to regain his footing. Maidana, the older man at 30, then sent Broner tumbling into the ropes early in the second round with a lunging left hook to the chin. After beating the count, the champion charged and wrapped himself around his opponent's legs in an attempt to recover. Maidana landed 57 punches in the opening two rounds compared to just 13 from Broner. But the American regained his balance, spending the next five rounds trading punches and clenches before Maidana took control. Broner, who previously held world titles at lightweight and light welterweight, was floored again in the eighth round with a left to the body and an overhand right. After another standing eight count, he was hit in the jaw by Maidana's head and went to the canvas again, staying there for three minutes as the challenger was deducted a point. Maidana pummeled Broner again in the ninth round, unleashing combination after combination the American struggled to avoid. The champion-in-waiting was content to see out the remaining three rounds, winning by scores of 115-110, 116-109 and 117-109. But he wasn't the only one with celebrations in mind. On the undercard, Keith Thurman stunned Jesus Soto Karass with a left hook to the chin that had the Mexican fighter out on his feet in the ninth round. Defenseless, Soto Karass took four more heavy blows before the referee stopped the bout. Earlier, Leo Santa Cruz successfully defended his WBC super-bantamweight title, unanimously outpointing Cesar Seda of Puerto Rico. The judges scored the bout 116-111, 115-112, 117-110 for the Mexican fighter, who handed Seda his second loss in 27 fights. Beibut Shumenov of Kazakhstan stopped Tomas Kovacs in the third round to retain his WBA super light-heavyweight belt.